Alaska’s most abundant seafood species, Alaska pollock is a lean, mild, and tender member of the cod family. 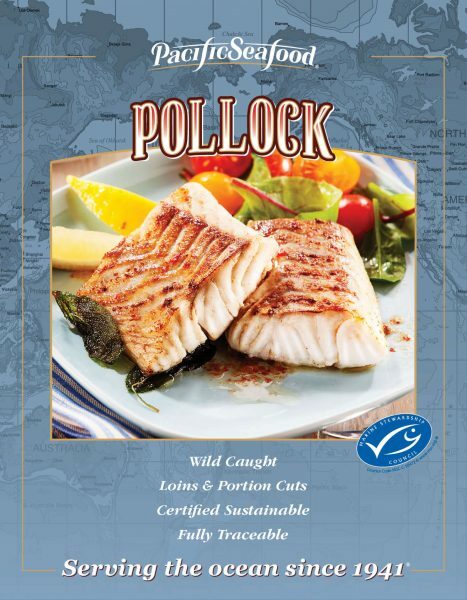 Slightly smaller and less oily than Atlantic pollock, Alaska pollock has a similar taste profile to haddock or cod. Sustainably harvested from waters off the coasts of Alaska. Alaska pollock is a versatile, easy to prepare fish, with a mild, sweet, appealing flavor, consistent snow-white flesh, and a tender texture with excellent flaking qualities. The most versatile of all whitefish varieties, it is delicious poached, baked, broiled, steamed, sautéed, or deep-fried. It can be paired with any number of flavors and ingredients in everything from fish and chips to delicately sauced fillets. With year-round availability, Alaska pollock is a good addition to any menu or seafood counter.